SAP convoca un hackathon relacionado con el Mobile World Congress. La ETSINF junto con SAP pueden proporcionar ayuda económica para cubrir costes a los estudiantes de la UPV que quieran participar (y sean seleccionados). Para ello, los estudiantes interesados deben escribir un correo antes del día 15 de febrero a secdir@inf.upv.es indicando su nombre así como la titulación que están cursando . 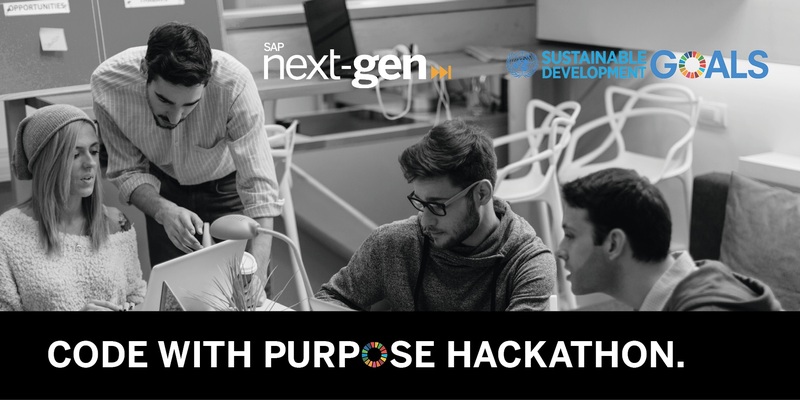 We are happy to announce our upcoming Hackathon ‘Code with Purpose’ by SAP Next-Gen which is all about the 17 UN Global Goals for Sustainable Development. The Hackathon will be held prior to the Mobile World Congress (MWC) Barcelona Friday – Sunday, February 23 – 25, 2018. Apply now and be part of an inspiring, motivated and thriving group of young people interested to speak in front of many experts at the MWC. The Code with Purpose program from SAP Next-Gen inspires the next generation developers to link their coding projects to social change supporting the UN Global Goals. In collaboration with SAP’s vision to help the world and improve people’s lives, we stand for the higher purpose beyond economic success. You are invited to develop disruptive ideas and prototypes contributing to social change. You have the opportunity to experience innovative SAP technologies to challenge and enhance your IT skills as well as entrepreneurial spirit. At the coding event each team is planning and developing an app based on latest SAP technology to contribute to a sustainable future. Let us jointly make some change happen! All participants will have the opportunity to visit the Mobile World Congress February 26 – March 1 and the winning team the honor to present their purpose driven innovation on March 1st in front of hundreds of experts in mobile technology at the world’s largest gathering for mobile industry. Apply via email uasupport@sap.com sending us your CV with a short statement (max. 5 sentences) why we should pick you. Thereafter we will inform all applicants if their application has been successful. In case your participation is confirmed, we will send out a separate e-mail and an invitation to our collaboration group SAP Jam where you will get further information and details. The hackathon will take place at UAB School Of Engineering and Economics, Carrer de les Sitges, 08193 Cerdanyola del Vallès, Barcelona. SAP Next-Gen will cover food & beverages throughout the event and entrance to the Mobile World Congress for all selected participants. All other costs need to be covered by you. It is important that the winning team is available on March 1, 2018 for their presentation at MWC. Join us and be part of three days full of learning, hacking, and fun in Barcelona.